Return two wanted cars to Wang Cars. 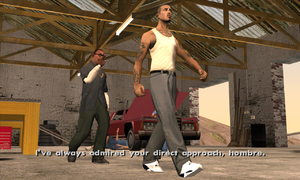 Test Drive is a mission in Grand Theft Auto: San Andreas given to protagonist Carl Johnson by Varrios Los Aztecas leader Cesar Vialpando from Carl's garage at the Doherty district of San Fierro, San Andreas. Cesar has found two more cars on the wishlist. He suggests that he and Carl go to an automobile showroom across town. Carl drives the two of them to Otto's Autos in Downtown. On the way, Cesar tells him that he, along with Kendl, enjoys the ambience of San Fierro, and that it has "something gentle about it". He also asks him stuff about The Truth, with Carl responding that though he may be weird, his sayings may be somehow true. They eventually arrive at Otto's Autos. They go to the second floor, and is greeted by a dealer. He does them a favor of leaving them alone, while the two steal a Sultan and an Elegy. Carl follows Cesar throughout the city, all while being chased by the cops. After a lengthy ride, they make it back to the garage in Doherty. The rewards for completing this mission are an increase in respect and $5000. The mission Customs Fast Track is unlocked. The Elegy and the Sultan will now spawn in the Wang Cars showroom. Carl Johnson and Cesar Vialpando taking the Elegy and Sultan from Otto's Autos. Cesar driving his Elegy through the second-floor window. CJ and Cesar speeding back to the garage with their new cars. CJ and Cesar dropping off the cars at the garage. This page was last modified on 15 May 2015, at 03:42.